The Library Resources integration in Canvas syncs with our LibGuides system to automatically load the appropriate library research guide into your Canvas course. We use the course name and number to determine if a particular course guide or a subject guide is the best fit for your course. Please contact your liaison librarian if you want an individual course page or you have additional questions. 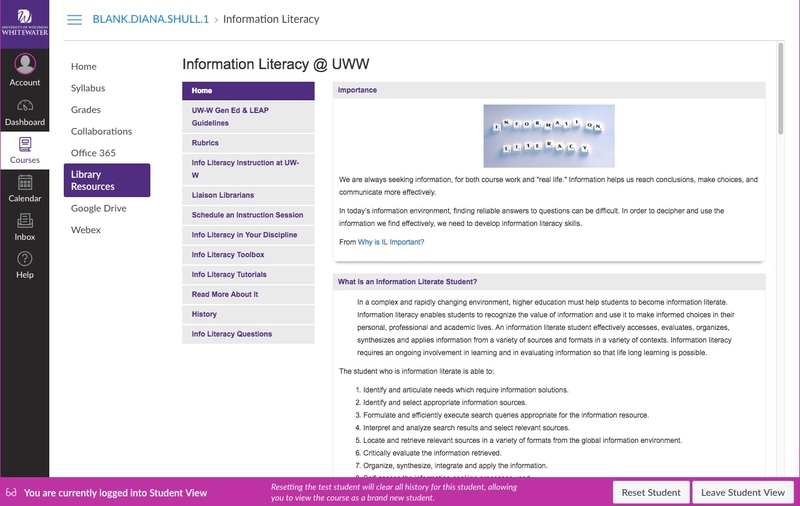 You can see our full list of guides at: http://libguides.uww.edu. From the Dashboard, select the course to which you will add the Library Resources integration. Select Library Resources and drag the rectangle up to the top portion of the page. Make sure Library Resources is somewhere in the top list so that it will show in the course navigation. Make sure to select SAVE at the bottom of the page after you have moved Library Resources to the top list. This entry was posted in tech tips and tagged Canvas, guides, lib guide. Bookmark the permalink.